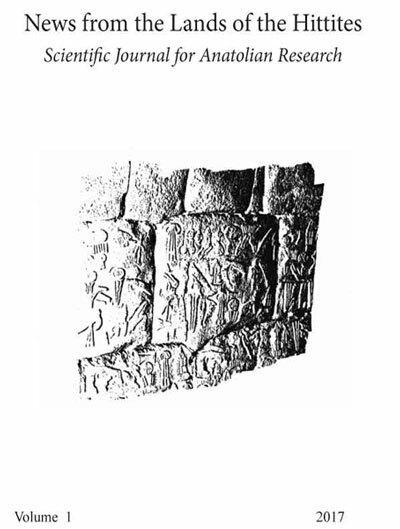 This new electronic journal was conceived to offer to colleagues and younger researchers a periodical publication specifically devoted to the Hittite culture and preclassical Anatolian civilizations. News from the Land of the Hittites aims to collect and publish philological, archaeological and historical essays, with the ambition of encouraging interdisciplinary collaboration among all scholars who either are active in Anatolia as archaeologists, or deal with ancient Anatolian documents. We are firmly convinced that only a continuous dialogue among philologists, archaeologists and historians will lead us to improve our knowledge of the preclassical cultures of Anatolia. At the same time, we are aware that Anatolia was a part of the greater ancient Near Eastern world and this journal will always be open to interdisciplinary works among experts of the different regions of the Near East and the Mediterranean area. We invite and encourage younger scholars and doctoral students to publish the results of their research in our journal; the choice of an electronic publication has the advantage of shortening the time usually required by a printed scientific journal between acceptance and publication. The scientific board comprises researchers from different parts of the world, such as Turkey, USA, Great Britain, Germany and Italy. This is fully consonant with the esprit of Hittitology, which is an international discipline. All the submitted manuscripts must be approved by the members of the scientific board and are also peer-reviewed by external experts, prior to acceptance for publication in the journal. This process assures the high quality of the essays and is required by the Italian evaluation system of scientific research. This journal will succeed only if you, our colleagues, doctorate students and collaborators work together with us and we thank you from now for your support.